Update: WikiLeaks has fired back at the Guardian, tweeting: "Remember this day when the Guardian permitted a serial fabricator to totally destroy the paper's reputation. @WikiLeaks is willing to bet the Guardian a million dollars and its editor's head that Manafort never met Assange." The Guardian's report was written by Luke Harding and Dan Collyns, and was based exclusively on unnamed sources. 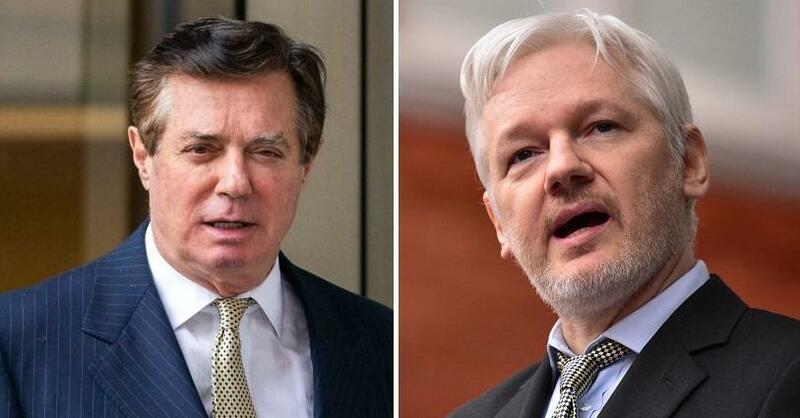 Paul Manafort, Donald Trump's former campaign manager, held secret talks with Julian Assange inside the Ecuadorian embassy in London, right around the time he joined Trump's campaign, according to The Guardian, which as is now the norm in reports of this kind refers to unnamed "sources." The 69-year-old Manafort has denied any involvement in the release of the emails, and has said that the claim is "100% false." While Manafort was jailed this year under a plea agreement with special counsel Robert Mueller, on Monday, Mueller said that Manafort had repeatedly lied to the FBI, breaching his deal. According to documents filed in court, Manafort committed "crimes and lies" covering a "variety of subject matters." According to The Guardian, Manafort's first visit to the Ecuadorian embassy occurred one year after Assange was granted asylum inside, according to two sources. To add icing to the cake, "a separate internal document written by Ecuador's Senian Intelligence agency and seen by The Guardian lists "Paul Manaford [sic]" as one of Assange's several well-known guests, along with... "Russians." So we have Manafort allegedly visiting Assange, in sandy-coloured chinos, and that Russians also visited the WikiLeaks founder. And none of this was known until today. The Guardian goes on to suggest that "The revelation could shed new light on the sequence of events in the run-up to summer 2016, when WikiLeaks published tens of thousands of emails hacked by the GRU, Russia’s military intelligence agency. Hillary Clinton has said the hack contributed to her defeat." Note that The Guardian has considered the "hack" settled, which agrees with Western intelligence assessments (the same Western intelligence that conducted espionage on Donald Trump's campaign). Nowhere to be found is the possibility that the emails were copied locally - a theory recently bolstered by a fresh analysis that flies in the face of a report commissioned by cybersecurity firm Crowdstrike - which was caught fabricating a report on Russia hacking Ukrainian munitions, and was forced to retract portions of their analysis after the government of Ukraine admonished them. The Guardian goes on to link Manafort to "black operations" against the political rival of Ukraine's former "Moscow-friendly president, Viktor Yanukovych," and that Manafort "flew frequently from the US to Ukraine's capital, Kiev - usually via Frankfurt but sometimes through London." Manafort is currently in jail in Alexandria, Virginia. In August a jury convicted him of crimes arising from his decade-long activities in Ukraine. They include large-scale money laundering and failure to pay US tax. Manafort pleaded guilty to further charges in order to avoid a second trial in Washington. As well as accusing him of lying on Monday, the special counsel moved to set a date for Manafort to be sentenced. And in perhaps the most shocking part of The Guardian's reporting, they refer to the highly salacious and largely discredited "Steele Dossier," saying that according to the document, Manafort was at the center of a "well-developed conspiracy of cooperation" between the Trump campaign and the Kremlin, and that both sides had a mutual interest in defeating Clinton, wrote former MI6 spy Christopher Steele. You know things are desperate when the Steele Dossier makes a guest appearance to once again bolster unsupported reporting.